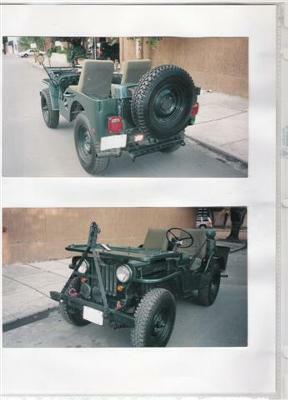 This is my restored '52 Willys Jeep CJ3A, which I bought off a local fruit grower in nearby Monterrey Mexico back in '96...and sold at the beginning of '98. The back part, where the original bumper goes has an adapted bumper with several holes perhaps for hitching a plow. The motor was already overhauled and painted red so I left it as it was. The Seats were upholstered in green cotton canvas. I didn't plan for a canopy top because it was intended for sunny weekends. It also had a front bumper hitch installed for pulling. Larry's Comment: I don't know about you Rafael, but I would be kicking myself for letting that one get away...ha!